If you’re going to update Agatha Christie’s And Then There Were None, the bestselling mystery of all time, you better bring your A-game. Agatha Christie’s fiendishly clever original broke all sorts of mystery writing norms. When it was published in 1939, 13 years had passed since Dame Agatha had published The Murder of Roger Ackroyd, and many critics claimed that And Then There Were None was close in concept and execution to that earlier high-water mark. Christie said And Then There Were None was one of the most difficult books she ever wrote and plotted. 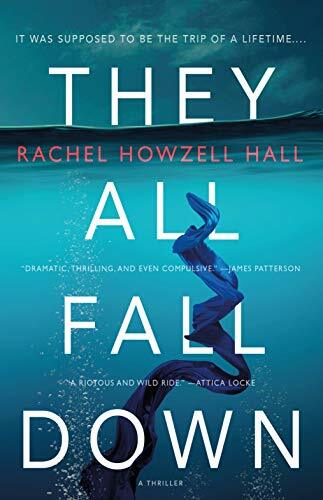 Eighty years later, here comes Rachel Howzell Hall with They All Fall Down, a modern-day homage to that classic—and it’s, well, killer. Readers familiar with the keen wit from Hall’s police procedural series starring Detective Elouise “Lou” Norton (Land of Shadows, Skies of Ash, and more) will recognize the sharp attitude and snarky world view as Hall introduces us to Miriam Macy. But where Lou Norton is grounded in police work, Macy comes from a land of luxury make-believe. Until she was laid off, Macy was the marketing and communications director for a luxury goods consignment store. It was her job to spin stories and write the ad copy to promote secondhand Gucci satchels and Chanel brooches. Now she’s unemployed. She’s in debt. She is divorced. Her ex chased after their daughter’s dance teacher. There are legal woes. Her family situation is, in a word, a mess. She is an emotional yo-yo, a Valium-popping bundle of nerves. So when Macy is invited to jet off to a remote island in the Sea of Cortez to participate in a TV game show and perchance win a bundle of life-affirming cash, she jumps at the chance—if she can only get through the TSA checkpoint at LAX with her nerves intact. She is convinced she is heading off to someplace better. She is convinced she can leave behind all the disarray in Los Angeles and, at least temporarily, escape. Not so fast, Ms. Miriam Macy. There’s the harrowing boat ride to the island, six strangers to figure out, and a major surprise waiting as soon as they reach land. The tables, indeed, have turned. And the bodies start dropping. Well, falling. The action takes place around a two-story Mediterranean mansion and in the nearby jungle as Macy and her dwindling band of housemates realize the game is much too real. Hall’s writing is a master class in strong, first-person voice. Readers are advised to not skim Macy’s recollections of her troubled life back in L.A. Macy’s biting wit, the near nonstop string of stinging commentary that might have put her in this very pickle, is her constant companion. Where Dame Agatha went with a cinematic, omniscient third-person voice for And Then There Were None, Hall has chosen a first-person voice for They All Fall Down. That choice presents a challenge. It requires a leap, so to speak, at the end. Hall takes this leap with a fearless flair—the same fearlessness she used to work in the shadow of Agatha Christie and give the story a fresh twist. In short, Hall makes it easy to take the plunge.